Can economic growth and environmental protection go hand-in-hand? Does climate change and resource depletion force us to radically imagine our economic systems? Is continued economic growth universally necessary and desirable? On 29-30 July, twenty-five scholars, activists, practitioners, civil society, and representatives of intergovernmental institutions gathered in Sheffield to grapple with these questions. 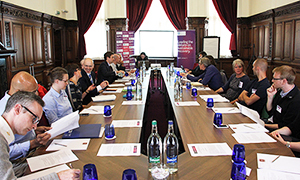 Organised by Hayley Stevenson, as part of her ESRC Future Research Leaders award, the workshop brought together people with very different perspectives on the challenge of sustainability. There is no single vision for a sustainable economy; debates feature many overlapping and competing concepts like sustainable development, green economy, green growth, harmony with nature, degrowth, steady state economy, circular economy, etc. The aim of the workshop was to take people out of their ‘informational cocoons’ to generate rich and challenging discussions, and to advance our collective understanding of challenges we face. 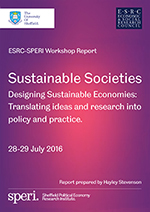 How and when researchers can engage with civil society and policymakers to advance ideas for sustainable development. You can see some of the participants discussing their insights in a series of workshop videos on the SPERI youtube channel. The report is also available in Spanish: Sociedades Sostenibles.